These schools were originally organised in the open air and were called ‘Schools Under the Sky’. Most still meet in the open air. 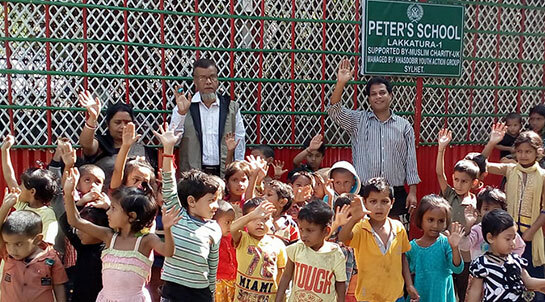 The schools serve children from the poorest families in the area – the children of workers on the tea estates, of rickshaw pullers, labourers and families running very small grocery shop businesses in the local market. The schools provide the children with very basic literacy and numeracy skills and develop the habit of going to school. There are currently 10 schools and 3 now meet in simply constructed school shelters so that they can continue during the rainy season and provide a more varied range of activities. Over 400 children benefit from these schools each year.